Longtime NIU chemistry chair Jon Carnahan died Wednesday at his home in Sycamore. He was 60. A well-loved fixture, Carnahan worked in the NIU Department of Chemistry and Biochemistry for 33 years and had served as department chair since 2006. His passion was working with students. He served as research adviser for 22 Doctor of Philosophy graduates, 10 Master of Science graduates and countless past undergraduate students. His service extended to numerous departmental and university committees. He was the author of more than 60 published papers, delivered more than 100 presentations at national and international meetings and held one patent. Carnahan had just entered a new phase in his life as a retiree. He was looking forward to making spontaneous road trips with his wife, Patti; spending time on the golf course; and hosting the countless friends and family that filled his life with so much happiness. He also eagerly anticipated the arrival of his first grandchild from daughter Betsy, who works in admissions at NIU; daughter Kelsey’s nuptials to Kai; and tropical vacations. 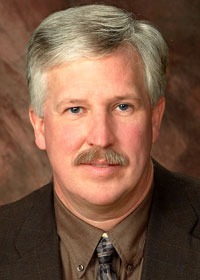 He earned his bachelor’s and master’s degrees from Southern Illinois University (1978, 1980) and received his Ph.D. from the University of Cincinnati in 1983. Carnahan with the Distinguished Service Award in 2011. Professional memberships and activities included the NIU Chemistry Club, the American Chemical Society, the past president-elect of the Society for Applied Spectroscopy, Sigma Xi and the Federation of Analytical Chemistry and Applied Spectroscopy Societies (FACASS). 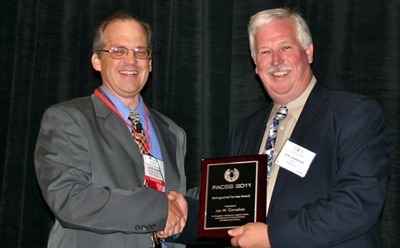 The FACASS honored him in 2011 with a distinguished service award for his contributions to the field. Visitation is planned from 2 to 5 p.m. Sunday, July 10, at the Butala Funeral Home and Crematory in Sycamore. Services are scheduled for 11 a.m. Monday, July 11, at the funeral home, with Elder Roger Hintzsche officiating. Burial will be private. In lieu of flowers, memorials will be used for a scholarship for the Jon Carnahan Memorial Fund, Department of Chemistry and Biochemistry at NIU in care of the Butala Funeral Home and Crematory, 1405 DeKalb Ave., Sycamore, IL. 60178.